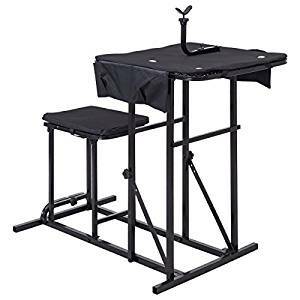 My friends over at the AirgunGuild are giving away a mighty nice portable shooting table. Yep, that’s right, Free Airgun Stuff! 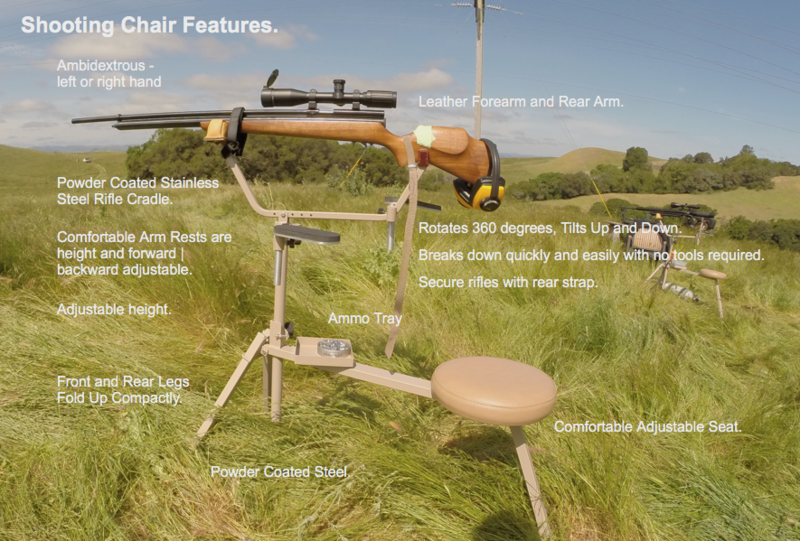 You need to be a registered user, and follow the rules for the airgun giveaway. 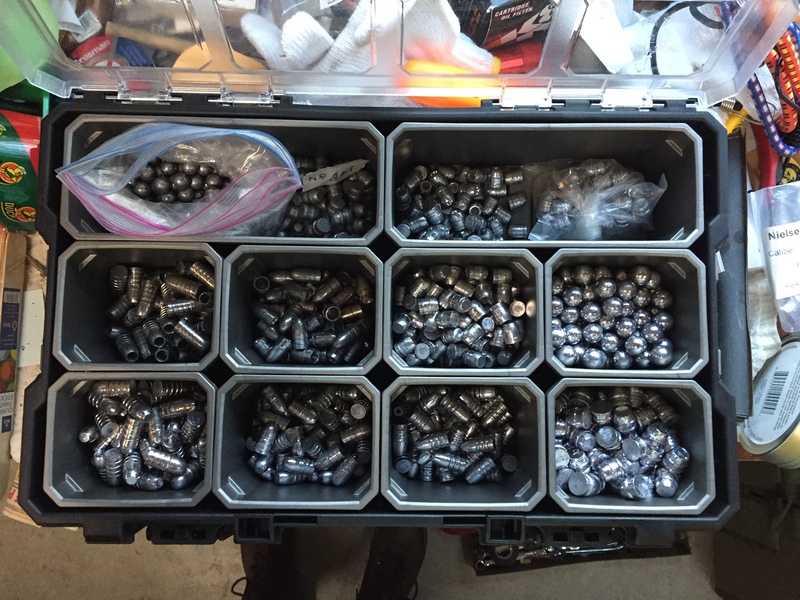 The contest is to guess how many lead bullets there are in the case. 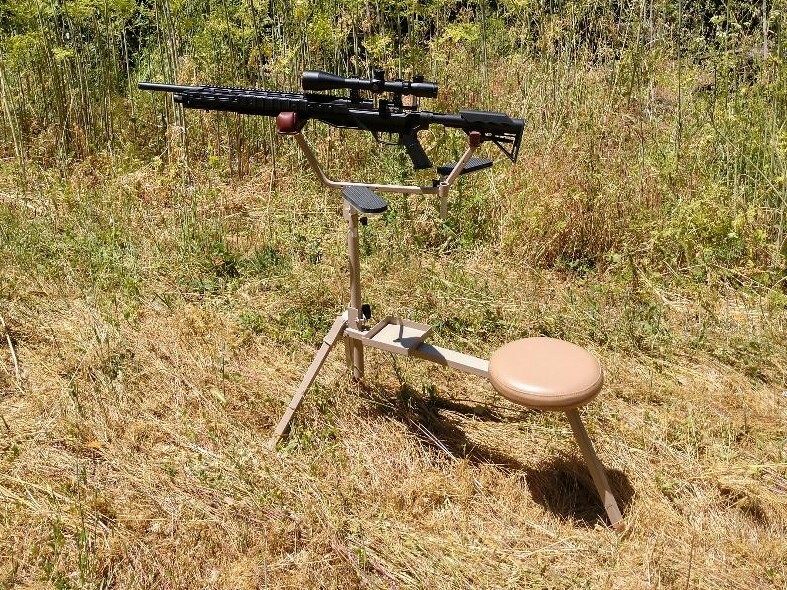 Winner gets the shooting table! Zoom on over, register, and give it a go! A Pairing of Quackenbush Airguns might sound silly, as it suggests a similar gastronomical pairing such as wine and cheese, or eggs and bacon. But perhaps it’s not so silly after all. In this case I have paired a .58 caliber Quackenbush Pistol with my latest airgun purchase, a .58 Quackenbush Outlaw Short Rifle. It made sense because I’ve started casting my own lead bullets and roundball for .58 caliber (actually .575 cal). 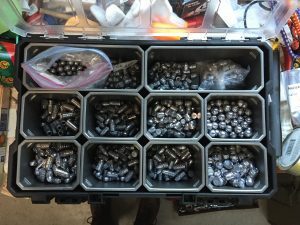 I recently got the bug to cast my own big bore airgun ammo and bullets. I had been sitting on the fence for a couple months, and dodged the urge to buy a melter, lead, bullet or boolit molds, .45 and .58 lead round ball molds, sizers, etc. But I fell off that fence in a moment of weakness, and ordered the whole mess up. Primary reason for getting into big bore airgun bullet casting is that it is difficult to find big bore ammo in sizes such as .45 or .58. When you do find big bore ammo you have few options to choose from, and it generally is cost prohibitive. Read that if you may as Expensive to shoot your big bore airguns. In the two previous installments on A New Idea For A Silent Pellet Trap, I talked about using rubber mulch as a pellet trap filler. I over built that trap to accommodate the biggest and most powerful of AirGuns. I aim to build a Silent pellet and slug trap that will accommodate all my air rifles including, up to and beyond the latest big bore AirGun in my arsenal, the mighty Dennis A. Quackenbush .58 cal Outlaw Short Rifle. We are talking serious power, designed for hunting deer and other large critters. 2. A safe trap that can stop .58 lead round balls and bullets as well as all the smaller pellets I fling at it. 3. A Silent trap that makes recycling the lead a much easier and complete chore. 4. A Silent pellet, slug and bullet trap that doesn’t weigh a hundred pounds. 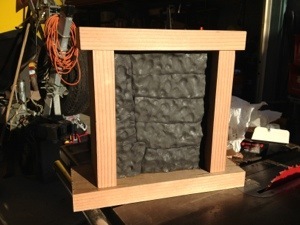 I looked at non-hardening clay since it was fairly inexpensive and would be as Silent as duct seal. But this medium had the same issue of not being easy to recycle the lead from. Hmmm. I suddenly had an epiphany and realized a perfect medium to use might be simple candle wax melted down in a big cube or cylinder. I got excited and started looking for cheap wax. Found a place on the web that sold old unused candles as scrap. $16 bough me 40 pounds of old funky candles! 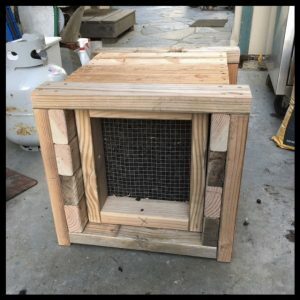 In our previous installment I outline experiences I have had with my duct seal filled pellet trap. It is indeed pretty silent, however there is difficulty in removing pellets from the duct seal and I’ve yet to come up with a reasonable method of recycling all that lead. Now that I have several big bore AirGuns I am chewing through a lot of lead. I have also toyed with an Uber Silent pellet trap framed in wood and filed with rubber mulch. This works but given the size and weight of this thing, once placed I am unlikely to want to move it. I haven’t used it all that much and so haven’t actually tried to retrieve the lead, so I’m not sure how easy it will be. I imagine I can dump the whole mess into a tub of water with the lead dropping to the bottom and the rubber floating. We’ll just have to see. Fast forward to the new idea. WAX! Yep, I had a brain fart. What if I had a metal container filled with melted candle wax? I’d shoot and shoot until the surface got too broken up, then put this container in pot of hot water, melt the wax and then easily strain out the lead bits which I can then melt down and mold into more pellets. I like the idea. So up next is to try to make this happen. I ordered up a bunch of used and old funky candles from a place on the internets called All Montana. These good folks sold me the wax at a good price though it required a lot of melting, and straining since the candles were in their cheesy Christmas, Easter and other holiday forms. Lot of Santy Claus Candles. Ugh. I’ve been chewing on a new idea for a silent pellet trap for a quite a while. That is I’ve been contemplating an update to the design of my old silent pellet trap. That design is essentially a wooden box filled up with duct seal putty I got at Lowes or Home Depot. I’ve filled that thing up with lead and have painstakingly pulled out pellets and round balls until my fingers screamed at me. And I ended up having to add another layer for the big bore beasts I have including a Sam Yang 909s, and a DAQ .58 caliber Outlaw Pistol. Those two airguns along with the Sumatra Carbine in .25 lay waste to the duct seal. I’m now up to three layers deep of duct seal since the big bores laid waste to the previous two layers of duct seal. Did I mention that pulling pellets out of duct seal is a pain in the behind? It is. And so I had a brain fart the other day, and came up with a way to easily clear out the old pellets, and recycle the medium that catches and holds the pellets. But you’re gonna have to sit tight while I do some experiments, and see if my theory works out.